WHY IS A MOTOR OIL’S ABILITY TO CLEANSE IMPORTANT? HOW DOES OIL PROTECT MY CAR’s ENGINE? WHY IS THERE A RANGE OF MOTOR OILS AND HOW DO MY CUSTOMERS KNOW WHICH ONE TO CHOOSE? WHY SHOULD MY CUSTOMERS BUY SHELL HELIX WHEN THEY CAN BUY ADDITIVES OFF THE SHELF AND MIX THEM WITH EXISTING OIL? IF MY CUSTOMERS DO NOT CHANGE THEIR OIL FREQUENTLY, WILL THEY REALLY NOTICE THE DIFFERENCE? DOES THIS MEAN THAT MOST PEOPLE DRIVE UNDER SEVERE DRIVING CONDITIONS? Keeping engine components clean is essential, as it keeps them in good condition. If the engine components and oil ways are dirty, the oil may not be lubricating and protecting the engine properly. Dirt build-up can also lead to premature engine damage. Shell Helix motor oils are designed to clean and protect engines for improved performance. Oil is lifeblood of your customer’s cars. If they use the wrong kind, they put their engine oil at risk of increased wear and corrosion, and the formation of blockages that ultimately lead to engine seizure. By put Shell Helix engine oil in the engine, your customer can carry on motoring with confidence and may experience the feeling that their car has just been serviced – all for less than the cost of a tank of fuel. By cleaning the engine – Shell Helix oils are design to clear away dirt, debris and deposits from engine components and to prevent blockages in important oil ways. The oil helps to lock up the dirt and render it harmless until it is removed at the next oil change. By reducing friction and minimizing wear – Shell Helix oils from a protective film over the engine components and have special additives that act between the moving surface to prevent contact and reduce drag. This help your cars engines to operate as quietly and effectively as the designers intended. By preventing corrosion and rust – Shell Helix oils protect your hard working engine components from corrosion beyond the normal oil-change interval. Benchmarking studies have shown that Shell Helix oils provide best-in-class protection and can help to extend your engines’ life and avoid expensive repairs. Engine oils are made up from three important ingredients: base oils, viscosity modifiers and performance additives. These are carefully selected and skillfully blended to enable the oil to provide maximum engine protection. There are two main types of base oil: mineral and fully synthetic. Engine oils labelled as “part-” or “semi-synthetic”, or “synthetic technology” contain a mixture of these two types. Mineral base oils come from crude oil that is processed in a refinery to seprate out the fractions with useful lubrication properties and remove unwanted components such as waxes. Unlike some engine oil manufacturers, Shell makes its own top-class mineral base oils by selecting the best crudes and employing stringent quality control procedures throughout the entire production process. That is why your customers can trust Shell Helix oils to give them Shell’s maximum protection and performance. Synthetic base oils give enhanced performance because they are manufactured using a more expensive chemical process than that used in mineral oil production. 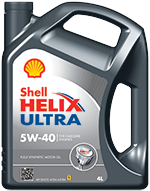 Because of this fully synthetic oils like Shell Helix Ultra flow more easily at start-up temperatures, when most wear occurs; are more resistant to heat; are more easily protected by antioxidant additives (oxidation is a natural degradation process that occurs in oil over time); and are less volatile than mineral oils. 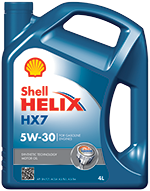 Shell Helix HX7 uses a carefully blended mixture of mineral and synthetic base oils to give enhanced performance. Viscosity modifiers increase the viscosity of oil at high temperature but have little effect on low-temperature viscosity. These enable the oil in your customers’ engines to flow properly when cold and also to remain thick enough to protect the engine components at high temperatures. Detergents keep your customers’ engines clean and neutralize the corrosive acids that forms as the fuel is burned. Dispersants remove soot and sludge, and hold it in the oil to prevent blockages. This dirt can then be removed from the engine at the next oil change. Anti-wear additives protect engines by forming a chemical layer between the moving parts. These additives are particularly important when motoring with high loads or during engine start-up. Antioxidants help to delay the natural degradation of engine oils, thereby protecting your customers’ engine more effectively for longer. Fraction modifiers reduce the drag between moving parts to increase fuel economy. Anti-rust additives are essential elements that prevent engines corrosion. All Shell Helix motor oils contain a special blend of these additives. This blend has developed from years of experience at Shell. You will notice numbers such as 15W-40 on oil pack label. These describe the viscosity of a multigrade oil at low and high temperatures. The first or “W” number stands for winter and describes how the oil flows at low temperatures; the second number describes how thick the oil remains at high temperatures – the higher the number, the thicker the oil. Lower-viscosity grades of oil, such as Shell Helix Ultra, make it easier for your customers’ engines to start from cold because they present less resistance to moving parts and, hence, take less power from the engine. This means that your customers get enhanced fuel economy. Your should change engine oil and filter at or before the end of oil-change intervals indicated by their vehicle’s manufacturer. These are based on distance travelled or time. By doing this, you keep your engine oil in good condition and provide the best protection for all their engine components. The car’s age – a lot is expected from new technology engines: high performance coupled with fuel efficiency. Advanced oils have been developed to help keep pace with increased engineering demands. For example, modern cars haveblow-by-gas recirculation that can cause extreme oxidation in old-technology oils and sensitive exhaust gas after treatment devices that can be poisoned by inappropriate oils. Use Shell Helix Ultra if the car is less than three years oil or is a classic car. 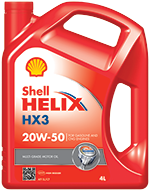 Use Shell Helix HX7 if the car is three to six years old. 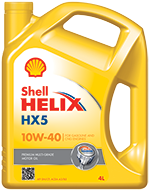 Use Shell Helix HX5 if the car is more than six years old. We have put Shell’s years of know-how into development into every aspect of the Shell Helix formula – from the base-oil technology through to the additives’ selection and blending. We have also channeled the experience we have gained in supporting leading racing teams, such as Ferrari, into the Shell Helix formula. It is designed to meet challenges, so, no matter how stressful their driving conditions, Shell Helix will help to clean and protect your customers’ engines. Adding an uncontrolled volume of additives to oils is like putting salt on apple pie! It takes years of additive blending experience to come up with right formula for Shell Helix oil, and the way the various additives are mixed in with the base oil is crucial to the oil’s overall performance. So our strong advice is to say to customers “Do not add additives if you aim to get the most from your car”. The addition of additives may lead to expiration of the manufacturer’s guarantee. Not changing engine oil on a regular basis can significantly reduce the level of protection provided against engine wear. Engine oil acts as a reservoir for all by-products that from when the fuel burns, including soot, sludge, water and acidic material, as well as unburned and partially burned fuel. At the same time, the stress placed on the oil during engine operation gradually depletes the components that determine the oil’s performance. Refreshing the oil on a regular basis ensures that the right balance of components is present in the oil, and also removes waste materials that might otherwise result in increased deposit formation, corrosion of metal components and increased wear. If you simply keep on topping up their oil, it puts more stress on the older oil that remains in the engine. And this stress issue has become worse in recent years, as the lighter, modern customers’ engines now run with about 25% less oils in their sumps. Shell Helix oil has a powerful ability to help to clean up your cars engine components and goes on keeping engines clean through to the next oil change. A recent study showed that 75% of car journeys involved trips shorter than 10km. These trips often incorporate a high level of stop-start driving, which can result in greatly increased engine wear if the oil is not changed on a regular basis. Overfilling the crankcase with oil is bad. It can cause excessive heat owing to the increased resistance, and thus shorten the oil’s life. In addition, a lot of oil will be splashed into the cylinders and cause excessive oil burning, thereby increasing the combustion chamber deposits that can cause operational problems. There is a popular belief that four liters of oil is just right for a four-cylinder car. This is not always the case. Check the car manual for the exact crankcase capacity. Your customer may be able to save some oil for topping up. Fill the crankcase to the level indicated on the dipstick – never more, never less. On the contrary, a motor oil that does not turn black is a sign that the oil is not working. Modern motor oils contain detergent-dispersant additives that help to keep engine internal parts clean by removing carbon deposits and then maintaining them in harmless suspension in the oil. It is better to have the carbon deposits in the oil so they can be drained off than for them to be left as deposits in the engine where they could do the most damage. Imported oils are not necessarily better. The API or equivalent rating is an objective basis for comparing different oils. Another basis for judging the quality of oils is the reputation of its manufacturing company. Strict quality conditions are required to produce and test good oil. Shell has developed a lubricant-blending quality control programme that guarantees that Shell Helix will be of the same high quality, wherever your customers purchase it. Motor oils differ in their physical characteristics, additive technology and additive content. Different oils are formulated to meet various specifications. The selected of a suitable motor oil will depend on the engine manufacturer’s recommendation and the type of service the oil will be subjected to. Using the right type of oil can be more economical in the long run. Adding commercially available additives to motor oil is like adding sugar to soft drink – it is not necessary. Premium motor oils have been formulated with all the additives necessary to ensure optimum engine performance. Additives cannot reduce the oil consumption in an old engine or restore the engine protection properties of an old oil. In fact, additives may upset the oil chemistry and create new problems. It is a safer and more economical to use quality tested and “packaged” premium oils. You should not waste money on additives. Oil does wear out. The primary enemy of oil is heat. At high operating temperatures, oil begins to oxidiseand thicken. Furthermore, motor oils can become laden with excessive carbon soot, water, acids, dust, metal particles and oxidized materials. These can plug oil of filters and passageways, cause abrasion or interfere with the proper action of some critical engine parts. You should change their engine oil regularly at the recommended oil-change interval.